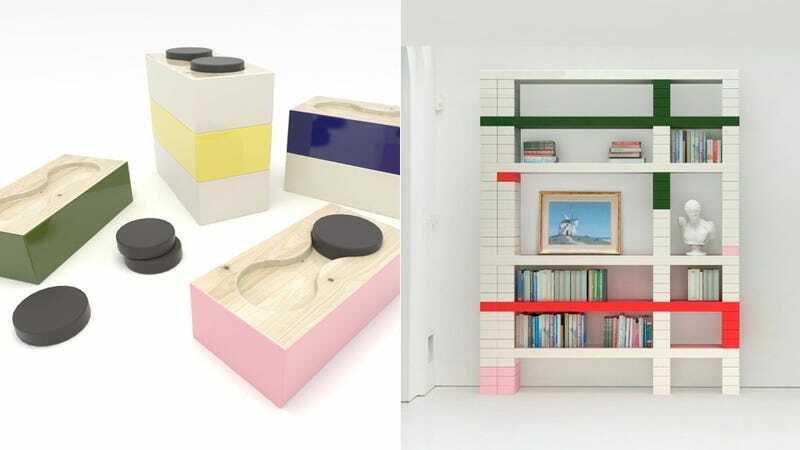 Designer Andy Martin's gorgeous glossed shelves may look sophisticated, but their art actually just dressed-up versions of the stacked brick block shelving he and his peers used to assemble in their college dorms. "When I was a student, in Sydney, in campus accommodation with three other students we built brick shelves everywhere, they ended up forming the walls between us," Martin told MocoLoco. "In later years they evolved intomirade of painted and graffiti structures which dominated our space." Martin's "Undergraduate" shelving bricks are CNC (computer numerical control) carved from fast-grown timber, then lacquer-coated to give them a more grown-up, dressed-up appeal. A flexible rubber puck fits into a center slot carved into each block, holding them together tight.